my friend sean has been asking/nagging/goading me for a while to try an adventure race with him. this time around he succeeded. 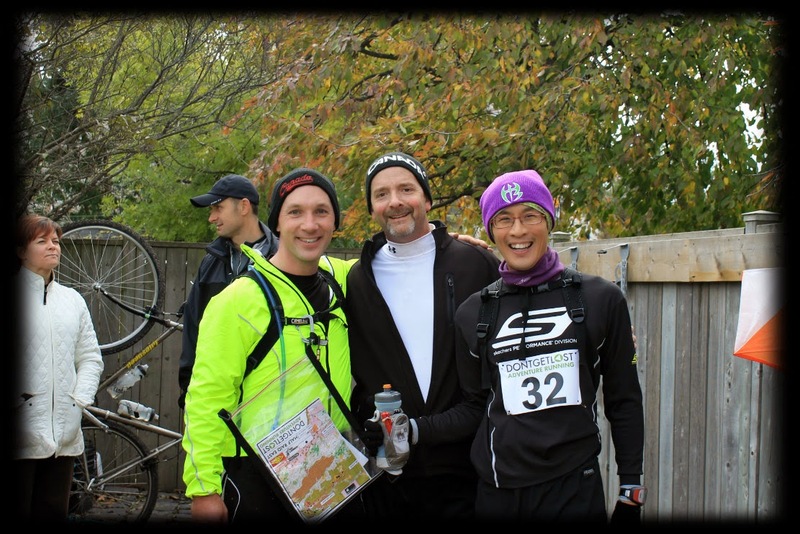 as a way to round out my running year i decided to join him and another friend of ours (norm) in tackling a running-specific adventure race put on as part of the Don't Get Lost Adventure Running Series called "Raid The Hammer" (the "Hammer" being the hamilton, ontario area). 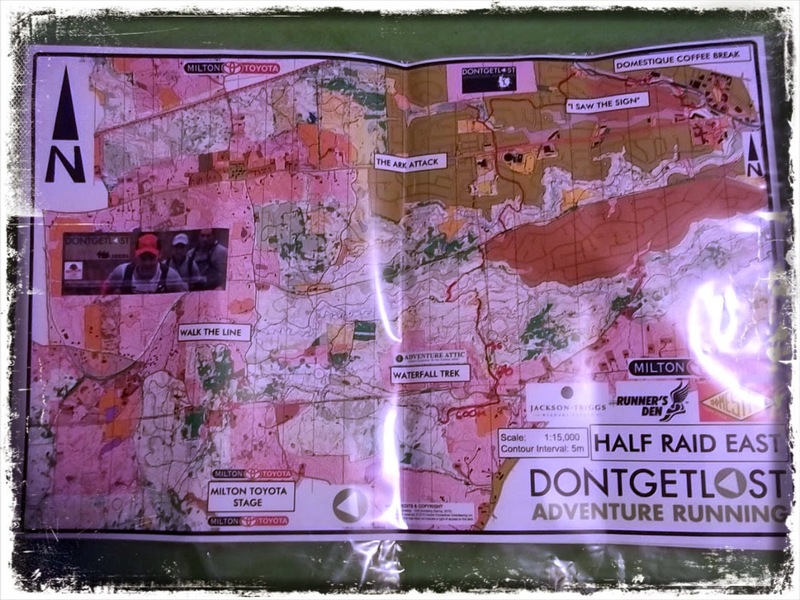 since norm and i were adventure racing virgins (sean has seen many an adventure race, including mulitiple disciplines such as canoeing, snowshoeing and mountain biking - and varying durations, from 8 hour to 24 hour events), we registered for the 'half-raid', advertised as being an 11-13km trail running and trekking distance. of all of the races which i'd signed up for this year, i found myself to be the most 'excited' for this one. there were other races - 10ks, marathons, ultras - about which i was more eager to compete, but this one genuinely had me smiling about what would take place. this was most likely the case because i wasn't sure at all what i was in for, so everything would be new - and because i had no expectations whatsoever. it was shaping up to just be a nice outing with some good friends. 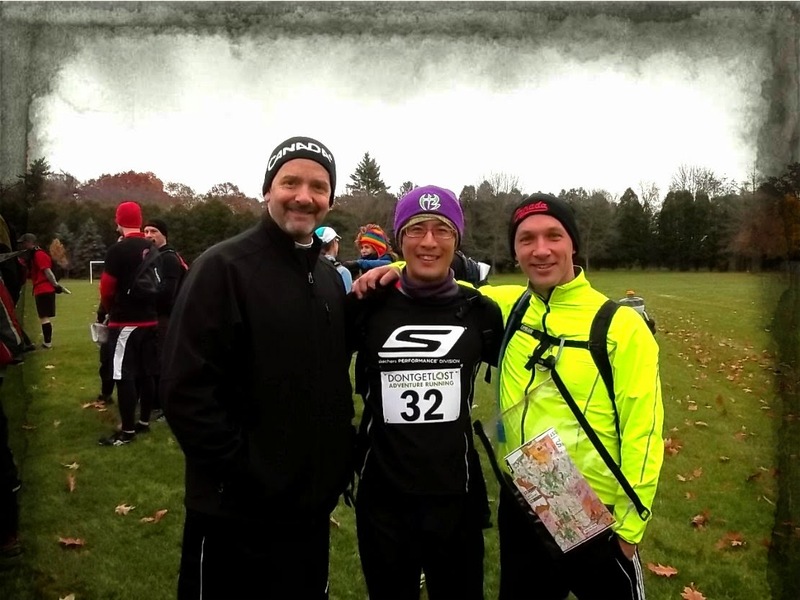 sean, norm and i travelled down to the start line in ancaster with three other mutual friends who comprised a rival team (we competed in groups of three). drew, joanne and brenda were each veteran adventure racers, so norm and i sat quietly in the back of the truck knowing that we were greenhorns in this mix - but maybe that would play out to our advantage. the pre-race pick-up all happens the day of the event as the course routes and maps have to be kept hush-hush to preserve the integrity of the challenge. upon receipt of our kit, we joined all of the other teams in reviewing the checkpoints that we would have to visit and identifying the best possible routes to form our attack plan. after a briefing by one of the race organizers we had about 15 minutes to get suited up for the day's outing. this included ensuring that we each had the required gear (a permanent pen, whistle, emergency blanket, compass, first aid kit, toques) as well the fuel, hydration, and protection (sean recommended donning some shin pads in anticipation of the bramble that we would encounter ... and was i ever glad that i listened) that would carry us over hill and dale. it was a mass start, but from there it really was choose-your-own-adventure in terms of how to get from A to B. while we were clumped up in traffic for the first 15 minutes or so, it didn't take long for the teams to thin out as various groups had climbing strengths, others were more daring in terms of the routes selected. we were out to have fun, but sean, norm and i each have a competitive edge so we certainly didn't want to be batting clean-up for the entire race. the checkpoints varied from being distinct hole-punch shapes that had to be recorded on your team sheet, to digital chip synchs, to fill-in-the-blank place names. on the half-raid there were no 'scatter' options, so each team had to travel together to every checkpoint, so although there were moments when one of us might be out running ahead of the other two it really served to no significant advantage (except to perhaps urge on the entire team's pace). we traversed all sorts of terrain - mostly groomed trail (wide or single track), but also plenty of trail-blazing up and down steep embankments, over mossy rocks, through mud marshes and streams. the final leg of the race took us through the neighbourhoods of the community of dundas, so there was even pavement with which to contend for the so-called "11-13km". across all of this i was pleased that i'd elected to don the Skechers GOBionic Trail as my footwear of choice, as they provided me more than ample traction and stability. sean (who was our orienteering lead, and an outstanding one at that) had noted for us that you really couldn't gauge your progress by the position of any other teams - partly because you didn't know who might be lost, have missed checkpoints, or even part of the 'full raid' distance which came from the opposite direction that the half-raiders were moving forward into. all in all we found most of the other racers a friendly and obliging bunch - although we did come across an incident on a stretch of trail that was busy with sunday afternoon hikers. apparently one of the teams had been in such a rush that on a narrow track they brushed by two ladies walking their dogs, inadvertently knocking the one woman over which resulted in her having a deep gash to her knee. it was a hit-and-run, but our team and one other (not having seen the incident itself) came upon the injured woman, at which point sean quickly jumped into action - pulling out his first aid kit, applying some antibiotic cream and applying a gauze-and-tape wrap to the wound. the lady and her friend were very appreciative of the help, while one of the women from the other team who'd stopped was beside herself apologizing on behalf of all the half-raiders: "we're not usually like that! ", adding "did you get their bib number?" and "what did they look like?" there was no real additional information that our victim could offer, but before we carried on to the next checkpoint (which was very close to that site) one of the course marshals actually happened upon the scene so he was able to at least bring some official representation on behalf of the event, and probably secure the appropriate information for liability purposes. all told, we finished our race in just over three hours, covering a total of 17.24 km by my garmin GPS. this was to norm's chagrin, as he was repeatedly reassured that this would be 'just about a 10k race'. this adventure race has been noted for the food and swag afterwards, and the organizers certainly didn't disappoint this year. from the two food trucks providing complimentary lunch meals to a pair of free socks from Fox River, everybody got plenty spoilt. even following the announcement and presentation of top finisher awards, the remaining teams were randomly invited to come and pick something from the prize table - so i got to walk away with a technical running hat as well. 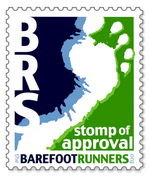 sean has already hit norm and i up about a winter adventure race - and while i am still in the midst of crafting my 2015 competition schedule, i admit that having now been indoctrinated into the ways of AR i would seriously consider it! and definite high-fives go to Don't Get Lost for this fantastic Raid The Hammer event - if you are at all looking for something different from the grind of road races, or even trail racing for that matter, i unreservedly recommend giving this event a lookover! Seems like a lot of confusion and a lot of fun. I am sure you fought the urge to run as fast you can. yep - organized confusion for sure! 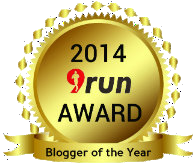 i think that it was good for me to have to run with a team, as that made sure that i didn't push myself too hard. and the terrain was as tricky as could be, so it was a much different beast than road running, or even trail running. but all of that just upped the fun factor!